Born: September 26, 1796 in Yarmouth Ma. Died: July 25, 1884 in Bourne Ma. in his 87th yr.
Married (1): January 21, 1822 in Sandwich Ma. 1. Lucy H. Parker Barlow Hewins; (March 8, 1827 – December 31, 1892); Married (1) Lewis Nye Barlow (1827 – 1887) (Levi Lincoln Barlow & Sarah/Sally Lumbert) in Sandwich Ma. on September 25, 1848; She married (2) Henry C. Hewins (1829 – 1878) (William Hewins & Love Handy) on Abt.1862; Lewis married (2) Bathsheba Ellis Howard (1833 – 1909) (Charles Ellis Howard & Mary Swift) in Lynn Ma. on January 11, 1858; Lucy & Henry are buried in Oak Grove Cemetery in Falmouth Ma. 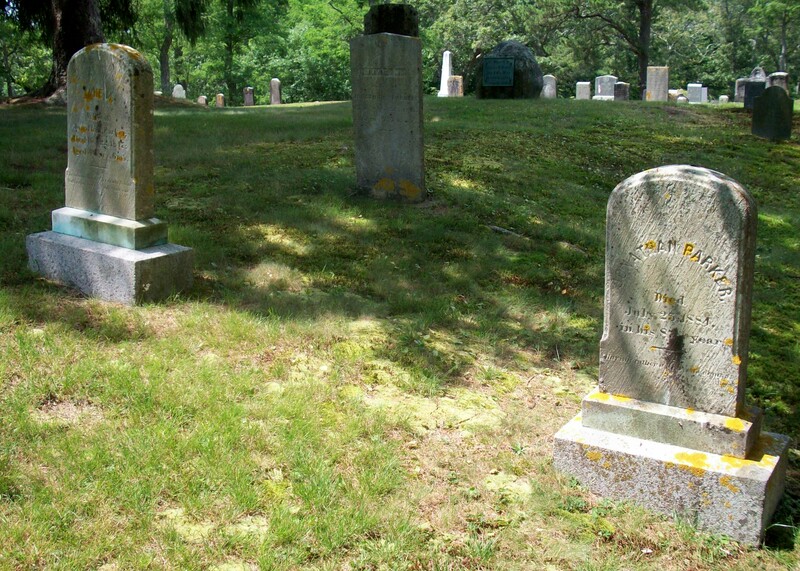 ; Lewis & Bathsheba are buried in East Cemetery in Meriden Ct..
2. 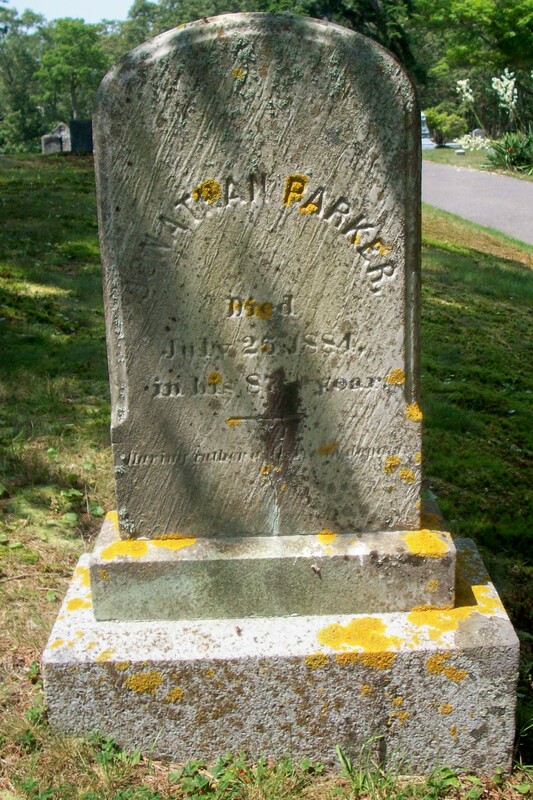 Calvin Morse Parker; (October 29, 1828 – November 6, 1907); Calvin died, widowed, in Bourne Ma. 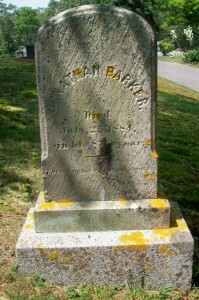 at 79 yrs, 17 d.; He was a carpenter; He is buried in Old Bourne Cemetery in Bourne Ma..
3. John Hinds Parker, Capt. ; (May 24, 1830 – October 13, 1915); Married (1) Eliza W. Ellis (1831 – 1875) (David S. Ellis & Esther Whiting) in Sandwich Ma. on November 27, 1851 & married (2) Hannah Ellis Blackwell (1836 – 1920) (Ellis Blackwell & Lydia Perry) in Sandwich Ma. on September 20, 1878; John was a mariner; He, Eliza & Hannah are buried together in Old Bourne Cemetery in Bourne Ma..
4. Charles W. Parker, Capt. ; (September 30, 1833 – May 14, 1889); Married Arabella Trask Ellis (1840 – 1919) (George B. Ellis & Ellen (–)) in Sandwich Ma. on March 8, 1860; Charles was a mariner & drowned at 55 yrs. ; Charles is buried in Old Bourne Cemetery in Bourne Ma..
To: Polly Lumbert Whitford; (1806 – 1899) (Hezekiah Lumbert & Mary (–)); Polly married (1) Solomon G. Whitford (1803 – 1833) (Silas Whitford & Mercy Godfrey) in int. October 16, 1829.